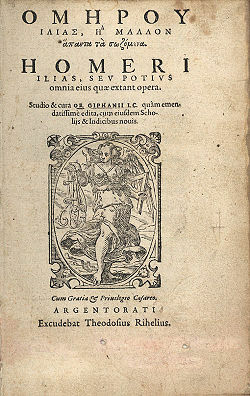 The Iliad (Ancient Greek Ἰλιάς, Ilias) is, together with the Odyssey, one of two ancient Greek epic poems attributed to Homer, purportedly a blind Ionian poet. The poem concerns events during the tenth and final year in the siege of the city of Ilion, Troy, by the Greeks (during the Trojan War). The names "Ilium" and "Troy" are often used interchangeably in classical literature. Of the many themes in the Iliad, perhaps the most important is the idea of moral choice. Achilles believes he has two options: He can either live a long, unremarkable life at home or he can die young and gloriously as a mercenary warrior. Military adventuring (that is, pillage and plunder) was a way of life in pre-Homeric times, and the many ruins of thick-walled cities and fortresses in the region give silent testimony to the fear that must have characterized life in the ancient world. Death in battle leads to honor—timae—and glory—kleos—important values of the day, more important than even right and wrong. One of the remarkable things about the Iliad is the way that Achilles, especially in Book 9, both embraces concepts of honor and glory and also rejects them. Most modern scholars consider the Iliad and the Odyssey to be the oldest literature in the Greek language (though some believe that the works of the poet Hesiod were composed earlier, a belief that some classical Greeks also held). Most scholars date them to the eighth century B.C.E., although a few argue for early or later dating. The first word of the Iliad is μῆνιν (mēnin), "rage" or "wrath." This word announces the major theme of the Iliad: The wrath of Achilles. When Agamemnon, the commander of the Greek forces at Troy, dishonors Achilles by taking Briseis, a slave woman given to Achilles as a prize of war, Achilles becomes enraged and withdraws from the fighting for almost all of the story. Without him and his powerful Myrmidon warriors, the Greeks suffer defeat by the Trojans, almost to the point of losing their will to fight. Achilles re-enters the fighting when his dearest friend, Patroclus, is killed by the Trojan prince, Hector. Achilles slaughters many Trojans and kills Hector. In his rage, he then refuses to return Hector's body and instead defiles it. Priam, the father of Hector, ransoms his son's body, and the Iliad ends with the funeral of Hector. Homer devotes long passages to frank, blow-by-blow descriptions of combat. He gives the names of the fighters, recounts their taunts and battle-cries, and gruesomely details the ways in which they kill and wound one another. Often, the death of a hero only escalates the violence, as the two sides battle for his armor and corpse, or his close companions launch a punitive attack on his killer. The lucky ones are sometimes whisked away by friendly charioteers or the intervention of a god, but Homeric warfare is still some of the most bloody and brutal in literature. The Iliad has a very strong religious and supernatural element. Both sides in the war are extremely pious, and both have heroes descended from divine beings. They constantly sacrifice to the gods and consult priests and prophets to decide their actions. For their own part, the gods frequently join in battles, both by advising and protecting their favorites and even by participating in combat against humans and other gods. The Iliad's huge cast of characters connects the Trojan War to many Greek myths, such as Jason and the Argonauts, the Seven Against Thebes, and the Labors of Hercules. Many Greek myths exist in multiple versions, so Homer had some freedom to choose among them to suit his story. The action of the Iliad covers only a few weeks of the tenth and final year of the Trojan War. It does not cover the background and early years of the war, Paris' abduction of Helen from King Menelaus, nor its end (the death of Achilles and the fall of Troy). Other epic poems, collectively known as the Epic Cycle or cyclic epics, narrated many of these events; these poems only survive in fragments and later descriptions. As the poem begins, the Greeks have captured Chryseis, the daughter of Apollo's priest, Chryses, and given her as a prize to Agamemnon. In response, Apollo has sent a plague against the Greeks, who compel Agamemnon to restore Chryseis to her father to stop the sickness. In her place, Agamemnon takes Briseis, whom the Achaeans had given to Achilles as a spoil of war. Achilles, the greatest warrior of the age, follows the advice of his goddess mother, Thetis, and withdraws from battle in revenge. In counterpoint to Achilles' pride and arrogance stands the Trojan prince Hector, son of King Priam, a husband and father who fights to defend his city and his family. With Achilles on the sidelines, Hector leads successful counterattacks against the Greeks, who have built a fortified camp around their ships pulled up on the Trojan beach. The best remaining Greek fighters, including Odysseus, Diomedes, and Ajax, are wounded, and the gods favor the Trojans. Patroclus, impersonating Achilles by wearing his armor, finally leads the Myrmidons back into battle to save the ships from being burned. The death of Patroclus at the hands of Hector brings Achilles back to the war for revenge, and he slays Hector in single combat. Hector's father, King Priam, later comes to Achilles alone (but aided by Hermes) to ransom his son's body, and Achilles is moved to pity; the funeral of Hector ends the poem. Iliad, Book 8, lines 245-253, in a manuscript of the late fifth or early sixth century C.E. The Iliad contains a sometimes confusingly great number of characters. The latter half of the second book (often called the Catalogue of Ships) is devoted entirely to listing the various commanders. 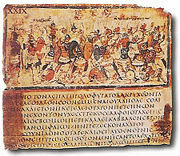 Many of the battle scenes in the Iliad feature bit characters who are quickly slain. Calchas (Κάλχας), a powerful Greek prophet and omen reader, who guided the Greeks through the war with his predictions. Paris (Πάρις), Trojan prince and Hector's brother, also called Alexander; his abduction of Helen is the cause of the war. He was supposed to be killed as a baby because his sister Cassandra foresaw that he would cause the destruction of Troy. Raised by a shepherd. Aeneas (Αινείας), cousin of Hector and his principal lieutenant, son of Aphrodite, the only major Trojan figure to survive the war. Held by later tradition to be the forefather of the founders of Rome. Cassandra, daughter of Priam, prophetess, first courted and then cursed by Apollo. As her punishment for offending him, she accurately foresees the fate of Troy, including her own death and the deaths of her entire family, but is not believed. The Olympian deities, principally Zeus, Hera, Apollo, Hades, Aphrodite, Ares, Athena, Hermes, and Poseidon, as well as the lesser figures Eris, Thetis, and Proteus appear in the Iliad as advisers to and manipulators of the human characters. All except Zeus become personally involved in the fighting at one point or another. The poem is written in dactylic hexameter. The Iliad comprises 15,693 lines of verse. Later Greeks divided it into twenty-four books, or scrolls, and this convention has lasted to the present day with little change. 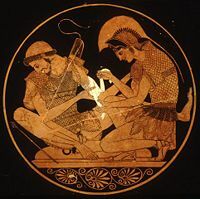 The Iliad and the Odyssey were considered by Greeks of the classical age, and later, as the most important works in Ancient Greek literature, and were the basis of Greek pedagogy in antiquity. As the center of the rhapsode's repertoire, their recitation was a central part of Greek religious festivals. The book would be spoken or sung all night (modern readings last around 14 hours), with audiences coming and going for parts they particularly enjoyed. Throughout much of their history, scholars of the written word treated the Iliad and Odyssey as literary poems, and Homer as a writer much like themselves. However, in the late nineteenth and early twentieth centuries, scholars began to question this assumption. Milman Parry, a classical scholar, was intrigued by peculiar features of Homeric style: In particular, the stock epithets and the often extensive repetition of words, phrase, and even whole chunks of text. He argued that these features were artifacts of oral composition. The poet employs stock phrases because of the ease with which they could be applied to a hexameter line. Taking this theory, Parry traveled in Yugoslavia, studying the local oral poetry. In his research, he observed oral poets employing stock phrases and repetition to assist with the challenge of composing a poem orally and improvisationally. Subjects from the Trojan War were a favorite among ancient Greek dramatists. Aeschylus' trilogy, the Oresteia, comprising Agamemnon, The Libation Bearers, and The Eumenides, follows the story of Agamemnon after his return from the war. Christa Wolf's 1983 novel, Kassandra, is a critical engagement with the stuff of the Iliad. Wolf's narrator is Cassandra, whose thoughts are heard at the moment just before her murder by Clytemnestra in Sparta. Wolf's narrator presents a feminist's view of the war, and of war in general. Cassandra's story is accompanied by four essays which Wolf delivered as the Frankfurter Poetik-Vorlesungen. The essays present Wolf's concerns as a writer and rewriter of this canonical story and show the genesis of the novel through Wolf's own readings and a trip she took to Greece. An epic science fiction adaptation/tribute by acclaimed author Dan Simmons, titled Ilium, was released in 2003. The novel received a Locus Award for best science fiction novel of 2003. The Iliad has been translated into English for centuries. George Chapman did a translation in the sixteenth century which John Keats praised in his sonnet, On First Looking into Chapman's Homer and Alexander Pope did another one in rhymed pentameter. Poet William Cowper's 1791 version in forceful Miltonic blank verse is highly regarded by those who manage to find a copy. In his lectures, On Translating Homer, Matthew Arnold commented on the problems of translating the Iliad and on the major translations available in 1861. In 1870, American poet William Cullen Bryant published a "simple, faithful" (Van Wyck Brooks) version in blank verse. There are several twentieth century English translations. Richmond Lattimore's version attempts to reproduce, line for line, the rhythm and phrasing of the original poem. Robert Fitzgerald has striven to situate the Iliad in the musical forms of English poetry. Robert Fagles and Stanley Lombardo both follow the Greek closely but are bolder in adding dramatic significance to conventional and formulaic Homeric language. Lombardo has chosen an American idiom that is much more colloquial than the other translations. This is a partial list of translations into English of Homer's Iliad. Homer: Iliad Books 1-12, & 13-24, ed. by Monro. Budimir, Milan. 1940. On the Iliad and Its Poet. This page was last modified on 25 February 2018, at 21:15.